The trip from Lake Havasu to Quartzsite was less than 90 miles, by far the least amount we have traveled in a day but we liked it! We have not been to Quartzsite yet and when were a few miles north of town we started seeing RV's boondocking out in the desert. When we actually pulled into town it was like we were in RVland. We have never seen so many RV's or RV related businesses in one location. Being newbies everything is new and exciting so we took in all the sights and sounds of the area. The real RV season for this area does not peak for a few more weeks, I can't imagine what it will look like then. The weather on day one was awesome with the temps in the upper 50's. That certainly beats the single digits the kids are experiencing in Salt Lake and the negative temps our friends and family in Wisconsin are enduring this week! However, day two we work up to rain and snow in the hills, the high today only got to 37. What a difference a day can make! Our home for the two days was a boondocking location called Dome Rock. We had read about this location from a fellow blogger and had the GPS coordinates loaded. As we approached the area we started to see RVs scattered throughout a several mile stretch of Dome Rock Road. It is quite intimidating pulling off the blacktop onto a two track dirt road in a new area for the first time. How does one even know that once you get on this road that you will be able to find a place to park or even turn around if you don't? Seeing several other big rigs in the area helped reduce these fears and we did find a secluded spot relatively easy. After setting up we headed into town as Barb said she would buy me a birthday lunch.....that's right it was my birthday! We found a really good pizza place Silly Al's, if you are in the area I would recommend their pizza. Prior to coming down here we had contacted two other RV'ers who were also in the area and we hoped to meet. We had met both of them online but had yet to meet them in person. The first couple was Allen and Donna Ferguson who were actually staying on Dome Rock Road as well. We had an idea what their rig looked like from pictures but how to find them with miles of boondocking along this road? Well, as we pulled back in from lunch, there was their Bighorn! They ended up parking a couple hundred yards from us and walked up when they were all settled. Allen and Donna (RV'ing With The Fergs) are a very nice couple who have been fulltiming for several years and are here for about a month. The next day we drove the truck over to another boondocking area several miles away and met up with two other couples who we knew from blogs and the RV Dreams website. Steve and Dianne (Living The Dream) have been fulltiming for several years and are from British Columbia. They have one of the more interesting rigs that we have seen, they transport two 4 wheelers in an enclosure right behind the cab of the truck and their 5th wheel behind that! Red and Pam have been on the road for about a month longer than us. One thing we realized while meeting with them is that if we are going to spend any real length of time down here is that we need to figure out how to get our Polaris Ranger down here as well. The off road trails are everywhere! After visited for a couple of hours we headed back to our rig for a quick lunch and visited the Ferguson's. Our goal on this trip was to scout out the area for future visit but the highlights ended up meeting three very nice couples we hope to meet up with down the road! How's Barb's ankle you ask? The bruising is diminishing and it is slowly getting better, she insists that she can go on hikes but I am trying to hold her back. We did go on one mini hike up a nearby hill to an old mine that we could see from our campsite. View from inside, that tiny little spec in the middle is our rig! Saguaro cactus dot the landscape. Tomorrow morning we pull up stakes and continue our journey south to Yuma where we will be for the next week while I get my dental work done in Mexico! Friday, December 26th started out as normal day, we spent the morning with the grandkids and got the rig ready for the next leg or our journey. We left Salt Lake at about 1:00pm destination Cedar Pocket in the Virgin River Recreation Area. Little did we know that the day would include a terrible tragedy! About an hour south of Salt Lake it began to snow, and snow, and snow. As we began climbing a few passes, there were a few areas where the snow covered the road and I had flashbacks to one of our first adventures "Class of 2014 Graduation". We, and many trucks had slowed down to 45mph to climb a few hills and as we approached a particularly slow truck right at the 6,600 foot summit I move over into the left lane to pass is when it happened…… there in the middle of the left lane was a Christmas Elf! There was nothing I could do, you don’t dare swerve on a snowy road. I just gripped the wheel and hope for the best but I heard the sickening “thud thud”. Barb said “What was that?” “A Christmas Elf, I just killed a Christmas Elf” I replied in terror. Sickened by this unavoidable tragedy we continued on for an hour or so until we needed fuel. We pulled into a truck stop, I fueled up while Barb took Daisy for a walk. She returned with a look of horror on her face and said “There are parts of the Christmas Elf stuck to the rig!” I went around the other side and sure enough there were elf parts stuck to one of the jacks! The only thing we could figure out was Santa was flying over the pass, blinded by the snow storm and had to make a sharp turn to avoid hitting the mountain. This poor elf, drunk from a little too much Christmas Nog lost his balance and fell out of the sleigh and well……you know the rest. I can only hope that Santa does not find out it was me but just in case, I am going to be super nice this year! We had never been to this recreation area and we were pleasantly surprised by the size of the sites as well as the quality of the restrooms. A $8.00 for the night we were very happy with this stop. The next day, we continued our journey south into Las Vegas where we stopped for a RV/truck wash as the rig got very dirty driving through all the snow and slush. From there we entered California and eventually back into Arizona where we ended our day in Lake Havasu City at a BLM camping area with about a dozen other rigs. One of the harder things to do when boondocking in a new area is finding a suitable site. We have done some research prior to leaving Salt Lake but until you get to the area you don't really know the terrain, whether our rig would fit or if the sites in the area we picked were open. As we drove through the area we thought had suitable sites we saw several other big rigs out in the desert so we pulled over and walked the area. As luck would have it there were a couple sites that would accommodate us and we pulled the rig into one. There are pros and cons in boondocking near other campers. There is safety in numbers and we felt safe leaving our rig there while we explored. The down side is that you have to put up with the off road vehicles driving by and the noise of the generators at night. As far as campsites rank, it is pretty near the bottom but warm, sunny and free! We stayed for two nights exploring the area for future visits. We did get on one hike while we were in the area. The SARA Wash Crack in the Wall trail is a 3 mile slot canyon trail where it narrows to arms width in some areas and has several drop offs that need to be negotiated. Daisy was having a hard time with several and we had to "repel" her with her leash. She was none to happy about that! There is one particularly steep drop off of about 7' that had a kind of smooth rock slide from top to bottom. When we got to this slide Barb went first. Thinking she was Super Women she sat on the slide and away she went! When she hit the bottom she swore several times and hopped away from the rock. Evidentially, when she hit the bottom her ankle buckled and shot pain through her body. I made it down a little more slowly bracing myself with my feet on both sides of the slide. We then sat down to assess the situation. Now neither Barb or I know a lot about physics, heck, we don't even understand E=mc^2 but we think the ankle buckling had something to do with mass, velocity and the hard ground. Whatever the reason she said she could keep going and walk it off but after another 1/2 mile I could see she was hurting so we headed back. When she got home, we put ice on it and it started to stiffen up. She needs to stay off of it but Barb does not do well at sitting down so we shall see how the next few days go. It got very narrow in some areas. We took the upper trail on the way back. Lake Havasu in the background. Speaking of the next few days, tomorrow we hit the road again for a couple days at Quartzsite. Thanks for stopping by! Believe it or not, We actually miss the snow! We don't miss driving in it or the bitter cold but do miss the beauty of it, walking through the woods and seeing it resting on the pines…… This is our first Christmas on the road, we were not sure what to expect, with the warmer weather and not snow it just does not feel like Christmas, but you go into the stores and you definitely see it! Like many things this year, we have to get used to a “new normal” and set our expectations accordingly. Don’t get me wrong, we are not unhappy, just getting used to something new! Christmas in a trailer is a lot like Christmas in a home but to a smaller scale. For almost 30 years Barb and I (and sometimes the kids) would go out and cut down our own Christmas tree. We have had some as high as 15’ tall! This year, although we did not cut it down ourselves, we still have a live tree! This one however is our smallest one measuring in at a whopping 3’. Barb has the trailer decorated nicely with the few Christmas knickknacks that she saved. Our first mobile Christmas tree! The snow is creeping down the mountains! This is also the first Christmas that I will not spend with my family (brothers and sisters) in……forever, I guess. Last year we had a big gathering at our “in-between” house in Wisconsin. My oldest sister spent Christmas Eve with us and when she woke up Santa somehow knew and brought her a stocking! I am going to miss seeing them, but on the lighter side this is the first Christmas we will spend with our own children/grandchildren in over 8 years and we are truly enjoying that! One of my biggest worries was whether or not Santa would be able to find us now that we were traveling. How does he know where all the RV nomads are at a given time? Not to fear, he did find us and we had a great Christmas! Christmas Eve was spent at Forrest’s house where they prepared a delicious dinner of prime rib and crab legs! Christmas day was spent at Jessica’s house starting early with sticky buns and opening of presents. That evening we had another delicious meal including a bushel of blue crab ordered from the east coast and shrimp. Lily on her new bike! Forrest and Shane digging into the crabs! We spent our final night in Salt Lake at Jessica’s having a sleep over with all the kids in our trailer parked out front of the house. Daisy and I elected to sleep in the recliner in the living room while Barb spent the night in the bedroom with kids. Now if you have ever tried to spend the night with a 5 and 3 year old it sounds like you are missing a treat. Barb said she was sandwiched between the two for the entire night and you have heard of the game "Whack a Mole" right? Well evidently Barb was an unwilling participant of a new game called "Whack a Grammy" where small sleeping children randomly whack grandma throughout the night. Barb said she was awaken several times throughout the night with a whack to the head! Needless to say, the night and the following morning was filled with the joy of frolicking and screaming kids! Daisy had a rough day! Kendall showing off her teeth! But alas, all good things must come to an end and after almost two months in Salt Lake it was time for Barb and I to move on. So with our belly’s full, our last load of free laundry for a while, one last long shower and enough grandchild time to hold us for a couple of months, we hit the road headed south. Our first stop Lake Havasue, Quartzsite and Yuma where we will be staying for a few days as I have some dental work done in Mexico……More to come on that! There is so much to do in the Lake Mead area that a week just isn’t enough time, especially when a couple of those days are lost to some kind of stomach virus. Call it food poisoning or the flu, it is no fun at all being sick in a 400 square foot trailer. Despite this set back we made the most of it with hiking, boating and sightseeing. The trip from Salt Lake took about 5 ½ hours and three states. The terrain was ever changing with several mountain summits in Utah followed by a long descent into the absolutely stunning Virgin River area of Arizona before entering Nevada into North Las Vegas and then the Lake Mead National Park from the north entrance. We had originally planned on staying at Boulder Beach Campground for 2 days and spending the rest of our time at Stewart Point boondocking area but at only $10.00 a night, we just could not leave the Boulder Beach. It is a great campground with a lot of beautifully landscaped, large pull through or back in sites and clean bathrooms. We met up with our friends, Steve and Joan (FOSJ), who are work camping in Lake Mead for the winter and we headed into Boulder City for dinner. Boulder City is located about 20 minutes from Boulder Beach Campground. I would say it is broken into two sections, the older quaint section with shops and restaurants and the new section with grocery stores, gas stations and food chains. If for some reason you don’t find what you are looking for there, it is just a short 15 minute drive to the Henderson and Las Vegas are where casinos and restaurants abound. We drove through the area looking at Christmas lights and stopped to visit a cactus garden that was decorated for the holidays. I would not want to pay this electric bill! We spent the next day hiking and our first hike was to the Anniversary Mines/Lovell Wash Narrows, a beautiful slot canyon hike. In addition to Steve and Joan, we were joined by fellow full-timers Herb and Kristina. We started this adventure parking near the mouth of an old mine. In addition to this historic mine they actively mining Colemanite while we were there. We found several pieces of Colemanite, it is a type of a crystal that is used for many things after mined. One of the more popular uses is in the manufacturing of heat resistant glass. After exploring the mine, we hiked up a winding narrow slot canyon. The canyon was formed by water flowing and eroding the limestone and mudstone layers which created these incredible canyons and surrounding formations. Although totally dry while we were there, there is evidence of the power of the water that occasionally flows through the canyon. Boulders weighing more than a ton are pushed around like pebbles when the water is at full force. As you walk through the canyon you are just in awe of the beauty and force of nature in this area and hope a sudden rain storm does not erupt overhead! 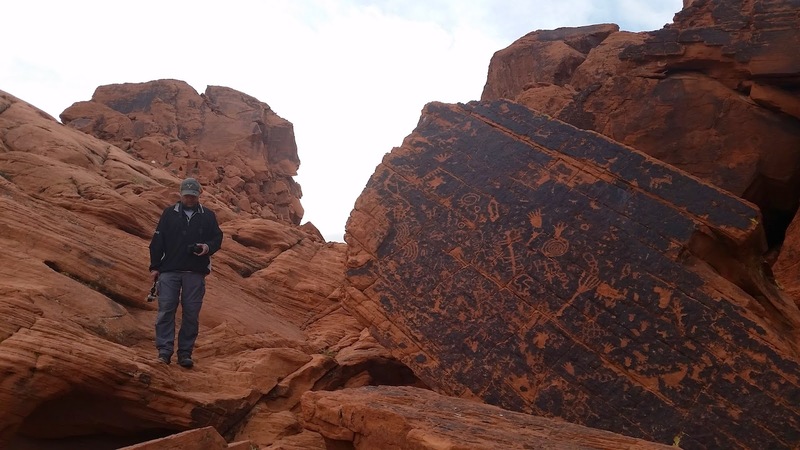 We followed that up with several short hikes in Nevada’s oldest State Park, Valley of Fire. Joan had timed this hike for the late afternoon and the rock formations and coloration were absolutely stunning. You can see how this valley got its name with all the brilliant red rock! The scenery was indescribable and the pictures really do not do it justice. We visited Atlatl Rock were there are several areas with petroglyphs over 3000 years old. An Atlatl is an ancient spear throwing weapon, some of which are depicted in the petroglyphs. As you view these petroglyphs you cannot help but wonder about the people who made them and what life was like for them back then. Being this is our first time in the desert, we spent a lot of time looking at different plants. Most of the plants were some form of cactus, it is amazing how many different varieties there are! We had our first experience with Creosote trees, definitely a smelly tree! No one can come to Lake Mead without a trip to Hoover Dam! Barb and I took a small walk on one of our down days and walked the new bridge as well as the dam itself. Both are amazing structures, you can't help but think about the architecture that went into each. 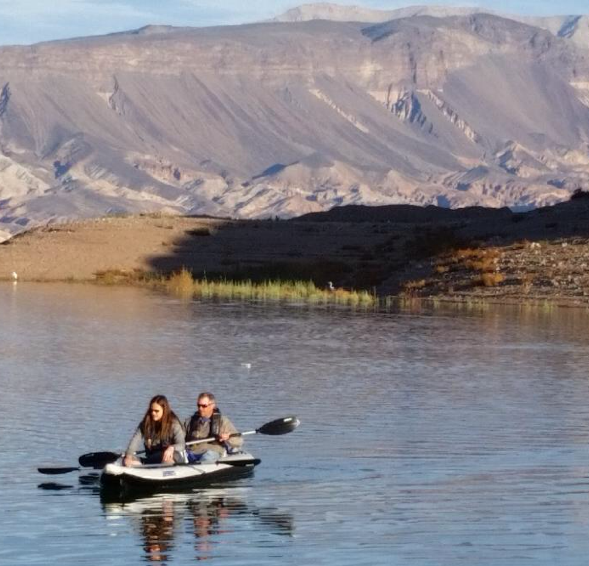 Prior to coming down to Lake Mead Barb and I had ordered a Sea Eagle 465 ordered from Tim at InflatableBoats4Less. This is a 15’ inflatable boat that we plan to take along on our journeys for adventuring and fishing. One of our goals for this trip was to get it out on the water to test it out. Although we only got out in it for a very short time, we are very pleased with this purchase. It was easy to set up, very stable and easy to paddle. I can’t wait to get out in it for a little longer! Overall it was a great trip, it was unfortunate we lost a couple days to our illness, it would have been nice to do some biking and get on a few more hikes. It was great to see Joan and Steve again as well as meet a few other fellow fulltimers. We will definitely be back to this area to explore some more but it is time for us to get back to Salt Lake for Christmas!